We are happy to see a new website that has just launched. It is specifically tailored for DIY people. 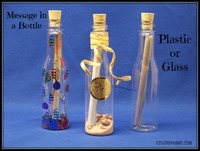 The message in a bottle products that we sell are featured through out the site. It is a great help for anyone who is going to "Do It Yourself" for any type of invitations. We have looked this site over and it has tons of helpful information. We have always tried to get people to cuttheir costs and DIY, now there is even more help out there. Just a note keep watch for a new DIY Message Bottle Contest coming REAL SOON.